FARMINGDALE, New Jersey (WABC) -- A woman is reunited with a class ring she lost decades ago, that turned up in New York City. 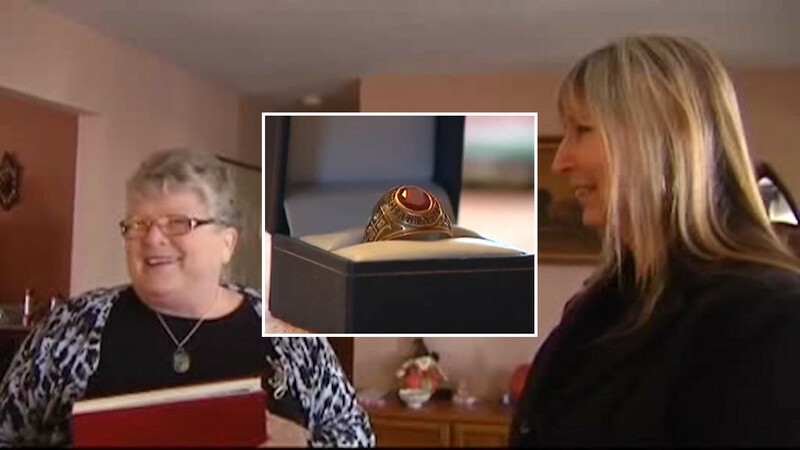 The woman who found the ring drove from Farmingdale, New Jersey, to Pennsylvania to hand-deliver it to its owner. Dorothy Grace Abbott's parents gave her the Roselle Park High School ring in 1963. In 1989, Debra Cohn found the ring while walking in Manhattan. She recently tracked Abbott down through Facebook. "I was walking and I kicked something, and I said, 'What the heck was that?' I looked down and it was a ring, and I said, 'Roselle Park, I'm from Roselle Park,'" Cohn said. "She's been nothing but nice, and the fact that she's driving up here, I thought that was so wonderful of her," Abbott said. Abbott got the ring for her 17th birthday, and now she has it back just in time for her 71st.